Summer is right around the corner. It’s already warm enough here in Florida that we’ve been going to the beach or local spring almost every weekend. When it’s this warm, I tend to gravitate towards salads for lunch and dinner. They are quick, easy and light, and also great for company. I made these a few days ago for a later lunch we shared with my Brother-in-law and nephew. For this salad, I made 1 thick cut ribeye, sliced it thinly and served it over a big beautiful salad made with curly leaf lettuce, watercress, radishes, tomatoes and onions. I topped it with an incredible Blue Cheese, Kerrygold Cashel Blue Cheese. It’s honestly the best blue cheese I’ve ever had. The consistency of this cheese is creamy and buttery. The taste isn’t too strong, but still has a very full, complex flavor. 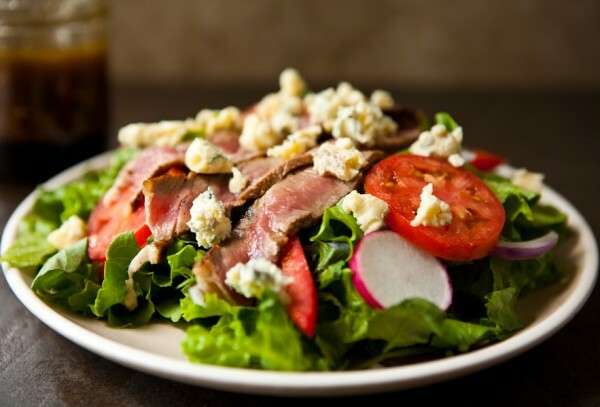 It pairs wonderfully with this steak salad. I also made a flatbread with Kerrygold Dubliner Cheese that we ate as an appetizer before the salad. I used marinara sauce, shrimp, red pepper and red onions. After it baked, I garnished it with lots of freshly chopped basil. The Dubliner had a wonderful flavor that went perfectly with the shrimp and sweet red peppers. I made a couple of these flatbread pizzas. They were great appetizers, and the kids loved them. I quickly marinated a thick rib-eye in a combination of balsamic vinegar and Worcestershire sauce before cooking it in a large cast iron skillet. Then I thinly sliced it and topped each salad. For the dressing, my brother-in-law made this simple balsamic vinaigrette. It had lots of garlic flavor and delicious Italian herbs. It paired perfectly with the salad and Kerrygold Cashel Blue Cheese. Preheat oven to 400°. 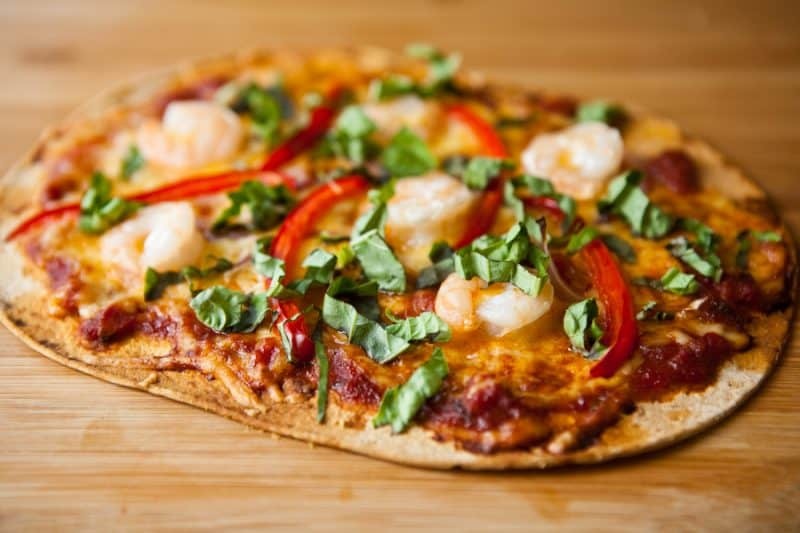 Top flatbread with marinara sauce, shredded cheese, shrimp, red peppers, and red onion. Bake at 400° for 15 - 20 minutes, or until cheese has melted and shrimp are firm and pink. Garnish with freshly chopped basil before serving. Combine lettuce, watercress, roma tomatoes , radishes and red onion in a large salad bowl. Crumble Kerrygold Cashel Blue Cheese on top. Preheat grill or large skillet. Add salt and pepper, balsamic vinegar, and Worcestershire sauce to steak. Grill or cook in skillet until desired doneness. Remove steak fro pan to rest and top with Kerrygold butter. Let steak rest at least 1/2 the length of time that you cooked it. Slice steak thinly and serve over salad. Add olive oil, balsamic vinegar, water, dried Italian herbs, garlic and lemon juice in a small jar. Add a lid and shake well. Pour over salad and serve. Find out all about these beautiful cheeses and butters at KERRYGOLD. Follow along on TWITTER & FACEBOOK! This post sponsored by Kerrygold. All opinions 100% mine. I am most definitely coming to your house! This salad and especially that flatbread is right up my alley! The cashel blue was pretty much meant for steak isn’t it? Swoon. I don’t know which I want to dive into first – that gorgeous salad or that very tempting flatbread. They’re both fantastic ways to use those Kerrygold cheeses (some of my favorites). This looks amazing, I can’t wait to see if I can find Kerrygold blue cheese in my store! Oh my lands! Heaven on a plate. 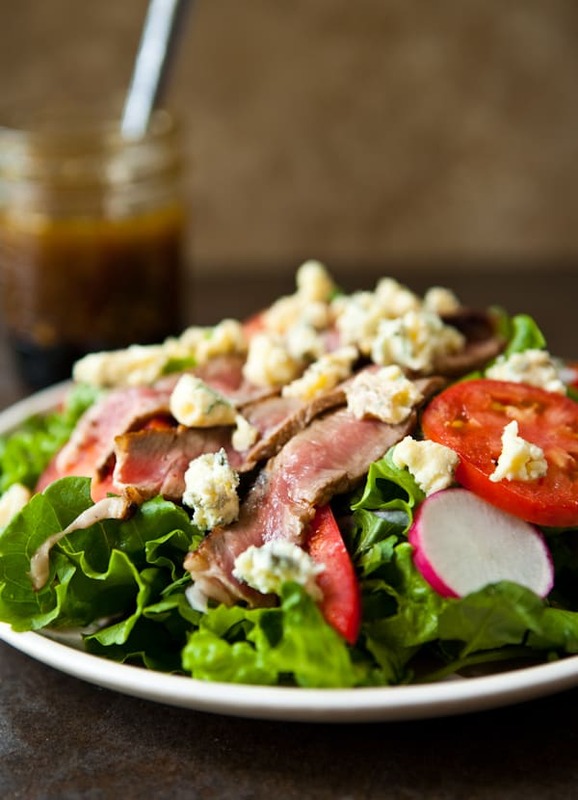 I’m thinking steak salad for dinner tonight! Angie – these look amazing!! I especially love the flatbread. Yum! This is gorgeous, Angie! I don’t like blue cheese but my husband loves it. This salad sounds right up my alley! The flatbread is so fun too! This is one delicious looking salad, Angie! Mmm, I am starving right now, and those photos are not helping — yum! Kerrygold is magical! This flatbread is aweeeeesome! Would totally impress at any event! That is just so gorgeous! I am a huge Kerrygold fan. We eats lots of Dubliner and I can’t wait to try the new blue! 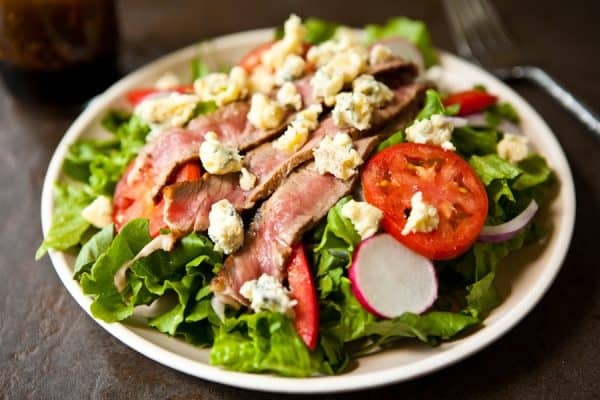 I love me a great steak salad! This one looks amazing Angie! A beautiful AND delicious recipe! We loved it so much; we shared a link to it with our readers. Feel free to check it out: http://www.steak-enthusiast.com/2013/05/summer-steak-salad-and-shrimp-flatbread/.